People brag about working 100 hours a week – the badge of honor that you’ve slaved at the office all those nights and weekends. If you are really working on something worthy of that kind of attention, then this is a commendable effort. But for the most part, the majority of those hours are wasted on fruitless pursuits that don’t make it into the final version of the project. 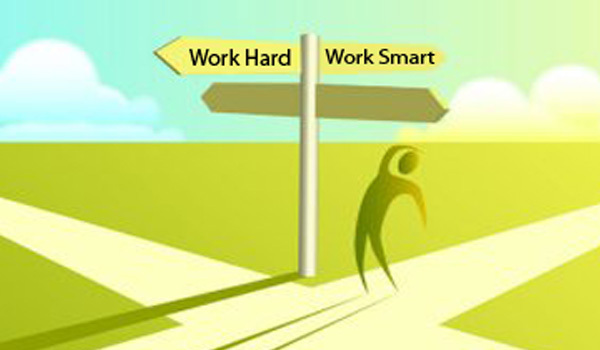 Work harder, not smarter is the professional motto that I strive to achieve on every project I execute. The number of hours I work doesn’t necessarily correlate to the efficiency and scale to which the project got done. In fact, I’d like to think that if I’ve maximized the best output with the best input, I could get things done in a reasonable amount of time. Working smarter means putting things on paper before you get started – making a project plan or an outline before diving into the work itself. It also means stepping back every 10% milemarker and assessing whether or not you are working on something relevant. For example, when I was recently putting together a business plan, I found myself going on random analytical tangents. Stepping back and saying “does this really matter?” or “Is it worth the trouble to get this one statistic?” were helpful in keeping myself tracked and focused. In order to work smarter, you also must dissect a larger task into smaller, mutually exclusive chunks. This ensures that if you hit a roadblock on one of them, you can easily move to a different assessment while you are waiting for a resolution. Remember: efficient use of time means you are working smart. Blindly working hard can often mean spinning your wheels on something that isn’t necessarily relevant, which is a time waster. If the goal is to get work done in an efficient manner while retaining the rigor and accuracy of high-quality work, mapping and planning will ensure that you work smarter, not harder.